Not often does an Oz architecture graduate’s blog get a help along like this. 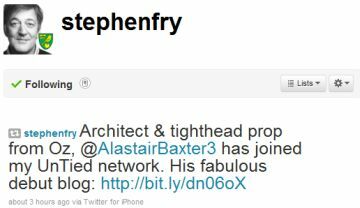 British comedian Stephen Fry has just tweeted his admiration for Alistair Baxter’s blog to his modest following of 1,632,440 people. So just who is Alexander Baxter? He describes himself as, “passionate about sports stadiums, 1950’s modernist houses, transport architecture, sustainability, German sailing boats and rugby.” And he brings it all together at his job working at Cox on sports stadiums. And he’s in the Wallabies. Erm… my great grandfather was an All Black – Stephen?? Sheesh, didn’t think someone would read the whole thing! I tried Rugby just once and threw the ball the wrong way – why would you throw it backwards?